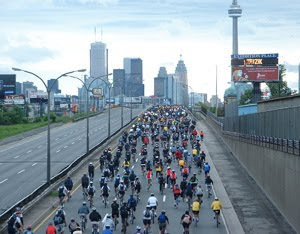 The Ride for Heart is a 25k/50k/75k ride on the Don Valley Parkway in Toronto, Ontario. I started doing this ride when I moved to Toronto back in 1998, and I've done it almost every year since. In fact, I give this ride credit for introducing me to longer distance cycling in the first place, which got me riding longer and longer and eventually doing Ironman! It's really the start of everything that followed, and so to them I am ever grateful. This year, I will be doing the ride with my daughter Meghan. She's 7! We did 50k two years ago when she was 5, with her on the trail-behind bike - I think that speaks to her tenacity and patience. She'll be on the trail-behind again this year, as it's a bit much for her to do it on her own... but in a few years... who knows! She's already built a love for cycling and this event, and I'm proud to share it with her!